Katie Crider was crowned Homecoming 2017 queen. 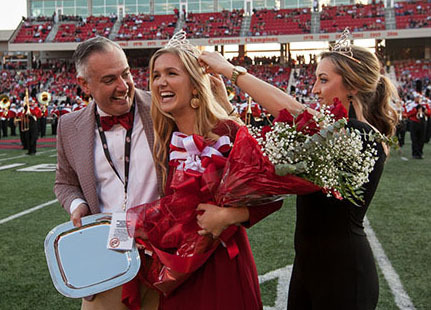 Twenty-two WKU students are candidates for Homecoming 2018 queen. Twenty-two students are candidates for Homecoming 2018 queen at WKU. WKU will play FIU in the Homecoming football game on Oct. 27. At halftime, the Homecoming Court will be introduced, followed by the crowning of the queen. Kickoff is set for 6:30 p.m. at Houchens Industries-L.T. Smith Stadium. Candidates will participate in numerous activities during Homecoming Week including a fall social on Oct. 21, an interview on Oct. 23, a volunteer experience and banquet celebration on Oct. 24, Chili and Cheese Luncheon and Pep Rally on Oct. 25 and the Homecoming Parade and Big Red’s Roar on Oct. 26. WKU students will cast their votes for queen in online balloting on Oct. 22. For more about WKU’s Homecoming 2018, visit http://alumni.wku.edu/homecoming. Makayle Botts of Glasgow, daughter of Jimmy and Cathy Botts. She is a Public Relations major and Communication Studies minor and is sponsored by Alpha Omicron Pi and Sigma Phi Epsilon. Savannah Brant of Lexington, daughter of Jim and Angela Brant. She is a Public Relations major and Photojournalism minor and is sponsored by Alpha Gamma Delta, Kappa Sigma and Farmhouse. Annalicia Carlson of Gallatin, Tennessee, daughter of Jason and Melissa Rhodes. She is a Criminology and Political Science major and is sponsored by Student Government Association. Catie Duchette of Fort Knox, daughter of Marc and Rebekah Duchette. She is an Exercise Science major and is sponsored by Delta Zeta and Phi Gamma Delta. Sara Ferguson of Morganfield, daughter of Martha and Robert Ferguson and Larry Strehle. She is a Corporate and Organizational Communication major and is sponsored by Department of Communication. Maggie Flanagan of Russell Springs, daughter of Melanie Flanagan. She is a Nursing major and is sponsored by Alpha Xi Delta and Sigma Nu. Cindy Gomez of Glasgow, daughter of Armando and Claudia Gomez Garcia. She is an Accounting and Spanish major and International Business minor and is sponsored by the Hilltopper Organization for Latin American Students. Harlee Havens of Lexington, daughter of Beth Havens. She is a Political Science major and Legal Studies minor and is sponsored by Omega Phi Alpha and Lambda Chi Alpha. Jade Haywood of Louisville, daughter of Marcus and Lisa Haywood. She is a Broadcasting major and Global Health Services minor and is sponsored by National Panhellenic Council. Erin Holl of Swansea, Illinois, daughter of Keith and Maria Holl. She is an Exercise Science major and Business Administration and Nutrition minor and is sponsored by WKU Student Alumni Ambassadors. Leslie Langley of White Mills, daughter of Charlie and Sue Ellen Langley. She is an Agriculture major and Family and Consumer Sciences Minor and is sponsored by Sigma Alpha. Haley Lord of Bowling Green, daughter of Mark and Melanie Lord. She is an Accounting major and is sponsored by the WKU Spirit Masters. Marie Mennefield of Nashville, Tennessee, daughter of Dewayne Mennefield and Beverly McCray. She is a Broadcast News major and Citizenship and Social justice minor and is sponsored by Black Women of Western. Cejay Moore of Bowling Green, daughter of Roderick and Katina Moore. She is a Criminology and Journalism major and Sociology minor and is sponsored by Panhellenic Association and Interfraternity Council. Claire Ottman of Owensboro, daughter of Dwight and Elizabeth Ottman. She is Biology major and Biophysics minor and is sponsored by Chi Omega. Mackenzie Pettus of Bowling Green, daughter of Jason and Carrie Pettus. She is an Interdisciplinary Early Child Education major and is sponsored by Alpha Delta Pi, Kappa Alpha Order and Alpha Tau Omega. Cassidy Ratterman of Louisville, daughter of Steve and Patty Ratterman. She is a Communication Sciences and Disorders major and is sponsored by Phi Mu, Sigma Alpha Epsilon and Alpha Gamma Rho. Yasmine Sadrinia of Somerset, daughter of Jay and Teresa Sadrinia. She is a Political Science major and Journalism minor and is sponsored by Sigma Kappa and Phi Delta Theta. Kylie Schaefer of Covington, daughter of Andy and Jamie Schaefer. She is an English-Creative Writing major and History minor and is sponsored by Kappa Delta and Pi Kappa Alpha. Hannah Shaffer of Southgate, daughter of Kathy Shaffer and Joyce Vorst. She is a Broadcast News and Journalism major and Sexuality Studies minor and is sponsored by Phi Sigma Pi. Corinne Warlick of Louisville, daughter of Josh and Liz Warlick. She is a Chemistry major and is sponsored by HonorsToppers. Sydney Wilson of Elizabethtown, daughter of Phillip and Dana Wilson. She is a Chemistry major and Biophysics minor and is sponsored by Baptist Campus Ministry.